Is Piers Morgan turning Hackgate into Hackmate? – The Slog. It emerged this morning BST that Nancy Dell’Olio, the wife of Britain’s former England soccer boss Sven Goran Erriksson, has spoken to Operation Weeting police officers of her “strong suspicion” that her phone was hacked by ‘friend’ Piers Morgan while he was editor of the Mirror tabloid newspaper some years ago. Ms Dell’Olio has told UK gossip journalist Mandrake that she is considering legal action against Morgan. It seems that the hacking took place at a time when Morgan’s newspaper was ‘singularly well-informed about her movements’. Of course, the embarrassment facing most of the Moron’s alleged victims is that they’re supposed to be his friends. Nancy herself admits,”I know Piers socially – I was at Celia’s [Mrs Arse] book launch – so it’s all a bit awkward.” But not so awkward, it seems, that she won’t go ahead if she can nail the Romping one. Meanwhile, attention is turning away from the self-incrimination evident throughout both of Arse Rim Pong’s narcissistic ‘books’, and towards the Grime Parson’s Facebook page. Most hacks are increasingly of the opinion that it’s much quicker and easier to simply go to the site, trawl through his ‘mates’, and then ask them if the lovely Piers ever listened in on their messages. The major difference between Piers Morgan and his partner in crime Andy Coulson is that whereas Coulson resigned twice because of things he knew nothing about, Morgan the Pirate was fired once for something he thought he knew all about – the Iraq War – but clearly didn’t. He will soon be fired again, this time because he thought he knew how to tough it out with denials, but actually didn’t. 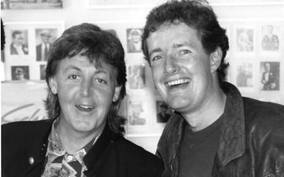 Follow the full saga of The End of the Piers Show here. Looks like the Court cases may be on the way! So he is not the Messiah, just a very, very naughty boy?! Look, you are giving the church gargoyle too much ink! We all know the type of child he probably was, his mother must have adored his wavy hair, and even encouraged more curls by dampening her fingers with lick then caressed the infant hair. He would then throw all his ducks out of the pram , manipulating his older siblings with shrieks , then uttered monotonous gurgles which everyone confused with early baby conversation- Thus his early attention seeking habits were developed. He might not have been an ideal birthday party guest, and so social skills may have been ruined by telling tales and not playing fair! I dare say he was always lurking around , picking up on snatched conversations, but being a spoilt child with an impossible string of names to his signature, I’ll bet he was a classroom snitch- teachers pet? akshully, there are more than two ways…. 3/ have access to the server that stores the voicemail messages, this is essentially computer hacking. What would be interesting is if it could be found that Max C. acted for both hacker and hackee. Double indemnity or double jeopardy? Also, of course, what we need is evidence that Piers hacked Jade Goody’s coffin with the collusion of Max Clifford. That would be the ultimate win-double. Excellent point, except that there are two forms of phone hacking – so thank you for allowing me to break the Wall of Silence. The ‘easy’ one is where you hack into the message box….the obvious way in spotted by Steve Nott in 1998. The tricky one is where you tap the phone. This can earn abusers many years of mailbag seamstress training. Given Sven was shagging Ulrika-ka-ka-ka, it is entirely possible that the Wappers were listening to Sven, while the Mirrors were listening to Nancy. I’m going to write a book about this, called Party Lines….if I ever get the time….and don’t end up with instant liver failure. it probably needs someone to take it through the Courts – the main breakthrough in the NOTW phonehacking case only came about when hackees solicitors started to demand information instead of cash. Up until then all concerned could get away with saying it was a conspiracy put up by The Guardian and the lefties, hence the “no new evidence” line. Errr.. If she left a message for Sven and the Mirror turned up, surely that means it was Sven’s messages hacked not hers?